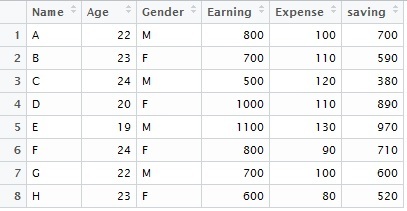 The blog covers the aggregation of data in R. In SAS we generally use Proc SQL or Proc Summary to do the same. There are multiple packages available in R for doing so,we shall explore most used one here. First let's create a data which we would try to summarize. 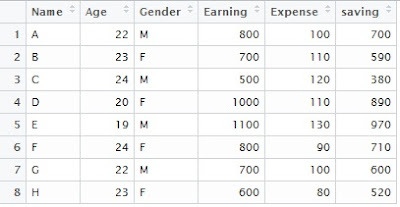 The output columns are required to be renamed to make more sense (i.e. 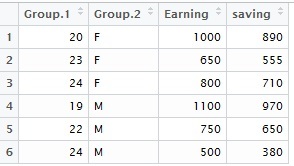 Group.1 and Group.2). na.rm = TRUE option basically tell R to not consider the missing values in the calculation. FUN means function, we can specify sum, mean, sd, median, min, max, etc. based on requirement. ** sd stands for standard deviation. If there all the numeric variables in the data, we need not tell the variables to be aggregated, it automatically aggregates all the numeric variables. But we recommend that you specify the columns to be aggregated. The function in this package is summarize. 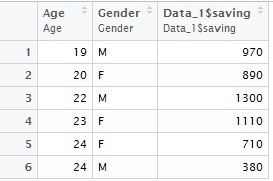 The Data_1$Saving column can then be renamed : names(aggre ) = "total_saving"